1. Indianapolis Colts-QB Andrew Luck – Stanford. Irsay has all but confirmed this is the pick. Luck walks in as the next franchise quarterback for the Colts. How well can he play in Manning’s shadow? 2. TRADE –Washington Redskins- QB Robert Griffin III, Baylor. The Heisman winner has some wondering if he is the best QB in the draft. The Redskins gave up a ton to get him and he will make or break Shanahan’s tenure with the team. 3. Minnesota Vikings- OT Matt Kalil, USC. The Vikings will have to kick the tires on Christian Ponder this year and will grab the top tackle available to protect him for years to come. 4. Cleveland Browns – RB Trent Richardson, Alabama. The Browns weren’t willing to pay what it took to get RGIII. 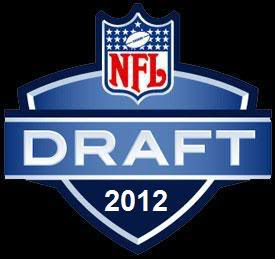 They settle for the only remaining elite talent in the draft to replace Hillis. 5. Tampa Bay Buccaneers- CB Morris Claiborne - LSU. The Bucs got torched much of last year and with Ronde Barber another year older, the best CB in the draft makes a lot of sense. 7. Jacksonville Jaguars- WR Michael Floyd, Notre Dame. Gabbert needs help and after a great combine, Floyd is the man to provide it. DE is another possibility here. 8. Miami Dolphins- QB Ryan Tannehill, Texas A&M. QB is the most glaring area of need for the Dolphins but its too late for RGIII. They have to decide if #8 is too high for the #3 QB in the draft. 9. Carolina Panthers- CB Dre Kirkpatrick, Alabama- The Panthers need help on defense and CB is the worst part of a bad defense. This is a bit of a reach for a guy with off field trouble but given that this is a deep DT draft (their other need), they wait till round 2 to address the DL. 10. Buffalo Bills- OT Riley Reiff, Iowa. The Iowa OT farm is at it again. The Bills addressed their DL in free agency, now they solidify the OL with the #2 tackle in the draft. 11. Kansas City Chiefs- OG David DeCastro – Stanford. The Chiefs have needs all over, DeCastro is the top interior lineman available and they are happy to get him at #11. 12. Seattle Seahawks- OLB Courtney Upshaw, Alabama – Upshaw would have been the better pick for the Bills, but unfortunately he doesn’t fit their system. Luckily for the Seahawks the #1 LB in the draft falls to them. 13. Arizona Cardinals – DE Quinton Coples, UNC – Coples should probably go higher as he is the best all around DL in the draft (Jacksonville makes sense for him). He falls to the Cards who draft the best player available. 14. Dallas Cowboys – NT Dontari Poe, Memphis – Poe looked like a beast at the combine and would fit well in the Cowboys system. He is moving up boards and right now this is the early end of where I would expect him to go. 15. Philiadelphia Eagles-LB Luke Kueley, Boston College- Kueley and the Eagles seem like a match. He fits their D and he is the best LB available here. 16. New York Jets- S Mark Barron, Alabama- The Jets have pieces on both sides of the ball to make a run if their QB situation could improve. Safety is one area of need and they can grab the best one in a very shallow safety draft at 16. 17. Cincinnati Bengals-CB Stephon Gilmore, South Carolina – Leon Hall is coming off a serious injury and Newman/Clements are over the hill. CB is the greatest area of need for the Bengals so they are happy to get him at 17. 18. San Diego Chargers- OLB/DE Melvin Ingram, South Carolina. The Chargers could go a lot of ways here. They have a real need at OT but they seem committed to rushing the passer. I think they wont be able to resist Ingram at 18. 19. Chicago Bears- OT Johnathan Martin – Stanford. In Martin Chicago gives Cutler another piece after adding Marshall in the offseason. 20. Tennessee Titans- DT Fletcher Cox – Mississippi St. Cox had a great combine and should be the #2 DT off the board. 21. Cincinnati Bengals- OT/OG Cordy Glenn- Georgia Tech. The Bengals address their other significant area of need by adding the best interior lineman on the board. 22. Cleveland Browns- WR Kendall Wright – Baylor. Wright caught a massive 108 passes for 16663 yards and 14 TDs from RG3 but is still only the #3 WR on the board. The Browns offense needs all kinds of help and a top WR should assist. 23. Detroit Lions- DE Whitney Mercilius - Illinois. With Suh beside him Mercilius should provide good production as a rookie and given what else the Lions have at DE they will need it. 24. Pittsburgh Steelers –OT Mike Adams – Ohio State. Steelers have needed help along the OL for several years. With Adams still available, this pick makes a lot of sense. 25. Denver Broncos – DT Michael Brockers LSU. The Broncos defense faded down the stretch against better QBs last year. DT is their biggest area of need and they get a potentially great one in Brockers. 26. Houston Texans- WR Stephen Hill – Georgia Tech. Imagine if Shaub hadn’t got hurt last year. Imagine if they had a #2 threat to compliment Johnson? Texans add Hill and potentially become a force to be reckoned with. 27. New England Patriots – DE Nick Perry – USC. The Patriots lost one of their team leaders in sack in Anderson, they grab Perry to continue to plug holes on the defense. 28. Green Bay Packers – RB Doug Martin – Boise St. The Packers have a dynamic offsense that seems to be winning in spite of their play at RB. Martin as the top RB left helps make that position relevant. They need help along the OL as well so that could definitely be a pick here. 29. Baltimore Ravens – LB Dont’a Hightower – Alabama. The Ravens get more help at LB while drafting Ray Lewis’ potential replacement. 30. San Fransisco 49ers – WR Alshon Jeffrey – South Carolina. WR is a definite area of needs for the 49ers. I think they will grab the top WR available here. 31. New England Patriots – SS Harrison Smith – Notre Dame. The Patriots get the only other premiere safety in the draft with Smith. 32. New York Giants – OT Bobbie Massie – Mississippi. Despite winning the Superbowl, the giants OL was a in trouble for much of 2011. Massie may have done enough in the postseason to move up into the 1st round.